Good dental health is not just limited to your pet’s teeth. It is absolutely critical for your pet’s well being and general body health! Healthy teeth = good breath! Tartar buildup and poor dental health will cause your pet to have foul smelling breath. Dental disease can lead to organ disease in dogs. It is a well established by research that dental problems and oral bacteria can affect the heart, kidneys and liver of a dog by circulating through the body and affecting these organs. Thus, good dental health can prevent several systemic medical conditions and complications in your pet. Retention of baby teeth can cause gum irritation and tartar build up. Adult dogs have 42 teeth but before the adult teeth come out, the baby teeth have to fall off…which sometimes does not happen. You should check with your pet’s vet if it’s baby teeth have fallen out and been replaced by big dog ones! 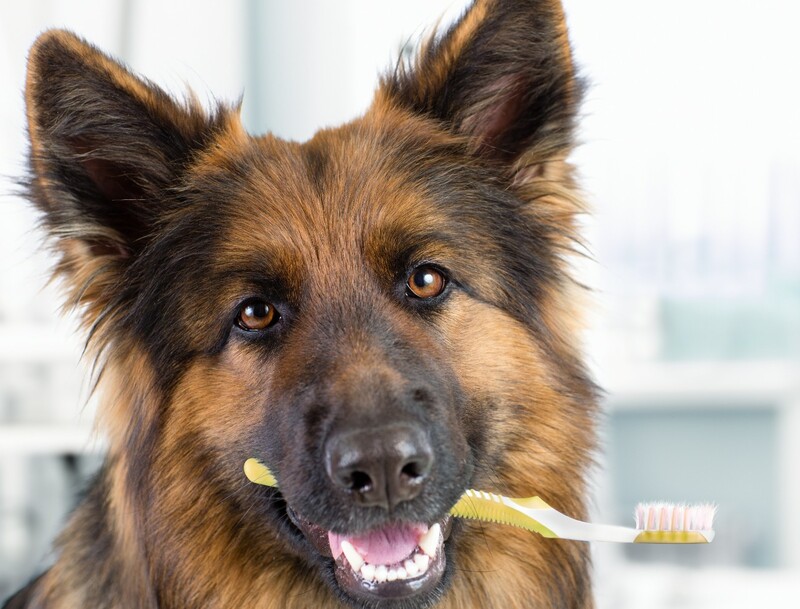 You brush your teeth daily and need regular dental care – why shouldn’t your pets? Watch this video to learn how to brush your dog’s teeth. Did you know that 4 out of 5 dogs over the age of 3 years have some dental problems? Plaque is a natural component present in the mouth and helps balance the oral bacteria. It is soft, colourless and easy to remove with a soft brush. But when it is left there without removal, it turns into tartar and firmly attaches itself to the teeth. This can cause irritation to the gums and lead to gingivitis (inflamed gums), periodontitis, tooth abscesses etc. which are very painful conditions for your pet! Dogs have great resilience to pain. Do you know that you may never know that your pet has a serious dental problem until it’s very advanced? Regular check ups will help avoid this. Teeth wear out! Your pet’s teeth go through a fair amount of wear and tear through the years, which may cause the pulp or root of the tooth to get exposed. This is extremely painful and can be avoided by taking your pet for regular check ups. Several premium quality pet foods use ingredients, which prevent tartar buildup in the oral cavity of the dog. Foods containing higher fibers also ‘scrub’ the teeth and help promote good dental health. Some toys are encourage chewing and scrubbing of the teeth while your pet plays with them helping prevent tartar build up, which is the root cause of most oral diseases. There are also several products available in the Indian Market e.g. Plaque Off which when put into a dog food and ingested, help greatly improve bad breath and prevent plaque and tartar buildup. Preventive dental care and maintaining good dental health is as important for your pet as it is for you, so keep a lookout for your pet’s smile and take your pet to the vet for regular dental check ups…your pet will thank you for it!